Logging is a tough job that deserves a tough boot. Try this durable waterproof logger, and you’ll find that your job just got a little bit easier. I have purchased these boots from Shoeline in the past and they are a great boot that wears well and customer service is great. 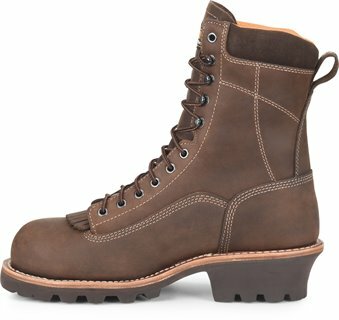 The most comfortable logger I've ever worn, and shoeline has the best prices any wear. I will buy my next pair hear. Great Boot. The break in time is little to none. I wear these daily and love them. More comfortable to me than my sneakers. Time will tell on how they hold up. Great boot. Very comfortable and the waterproof liner keeps your feet nice and dry. I grease them up every 4-6 months and they usually last about 18 months for me until the sole wears out. I really like this boot. I order my size, it didn't fit right. I guess because of composite toe. Shipped them back no problem for free and they shipped me a size larger for free. I'm very pleased Shoeline. My husband loves his boots. Very comfortable. He wears them daily to work. I have owned two pair of these boots and still have both. the pair I wear for work in a scrap metals yard I have worn for 3 years and they are still serviceable and water proof. I was a redwing fan for many years and then I purchased these and will never wear another pair of boots. Very happy with this boot. Just what i need with the conditions that i am subjected to. I love the snug and comfortable fit. All the guy that i work with really love the look and style of this boot. And of course i do also. So far so good. I would recommend this boot to everybody. Thank You from a very happy camper. Love this boot! Came with in to days of ordering. I loved them so much I even slept in them! 2nd pair i've purchased. very pleased with them. fit like a glove. I have been wearing Carolina boots for more then 10 yrs. I have never had a problem with them lasting more then 3 yrs. I have worked as a diesel mechanic for 16 yrs. best boots I have ever worn. will never stop wearing Carolina boots. Other than one of the laces being cut on arrival the boot fits and wears good so far. I've only had them one day due to weather causing shipping delays. Bought for my son. He is very pleased overall! As a truck driver for a living I found this boot very comfortable. Break in time was less than the norm. So far quality is great. I was amazed that I received the boot on my doorstep 2 days after order. Company has great customer service too. I do plan to purchase more. Great boot. I have a previous pair of Carolinas and they lasted 2 years of water coolant oil mountain terrain and just abuse. These boots are very supportive to the foot and feel like a tennis shoe. I’’m glad I bought them. Very very comfortable...feet stay warm and dry Take very little time to break in. Must say customer service is excellent and exchanges are hassle free. 1st pair had a small defect...called in and had the 2nd pair within days. Thank you shoeline I will be a lifetime customer and will recommend you to everyone looking for great products and outstanding service. Always Liked Carolinas. Provided you get the boots with the Vibram sole and the solid upper. They will last forever. Had my last pair for 5 years and wore them everyday.